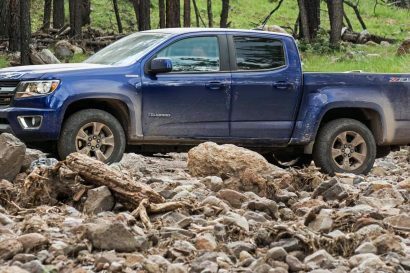 Throughout the history of our publication, the Toyota Tacoma has remained the most popular vehicle among our readers, a reflection of the model’s reliability and accessibility. As travelers, we ask a lot from our 4WDs, expecting durability, capability, comfort, and capacity, all the while hoping for a great value and even some rugged good looks thrown in. 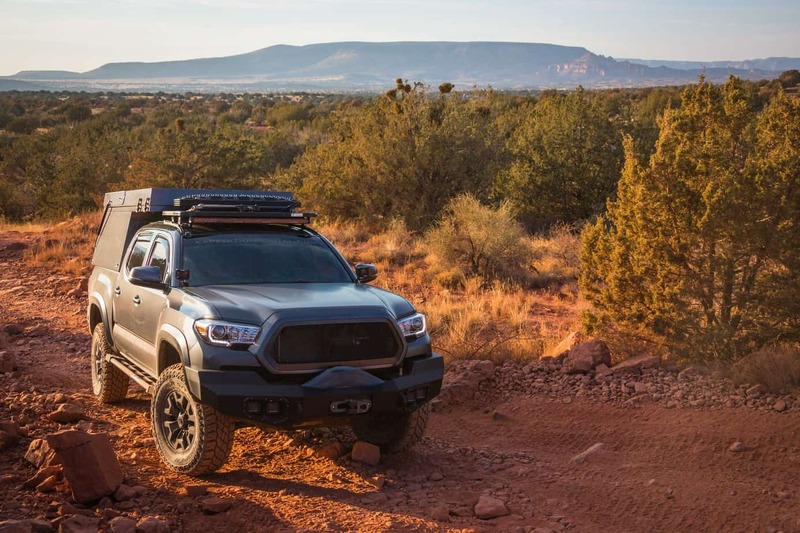 The Tacoma is all of that and so much more, and has become an icon for North American overlanders. In 2004, we acquired our first Tacoma, a 4-door model that we modified for adventures around the Desert Southwest, ultimately taking it to the Arctic Ocean (Winter 2007 issue) and all the way down to the Darién Gap. It was originally a project for Expedition Portal and was soon adopted as Overland Journal’s first project. Over a decade later and in time for our 10th-anniversary year as a publication, our team decided to revisit the Tacoma and assemble our newest interpretation of this ubiquitous machine. 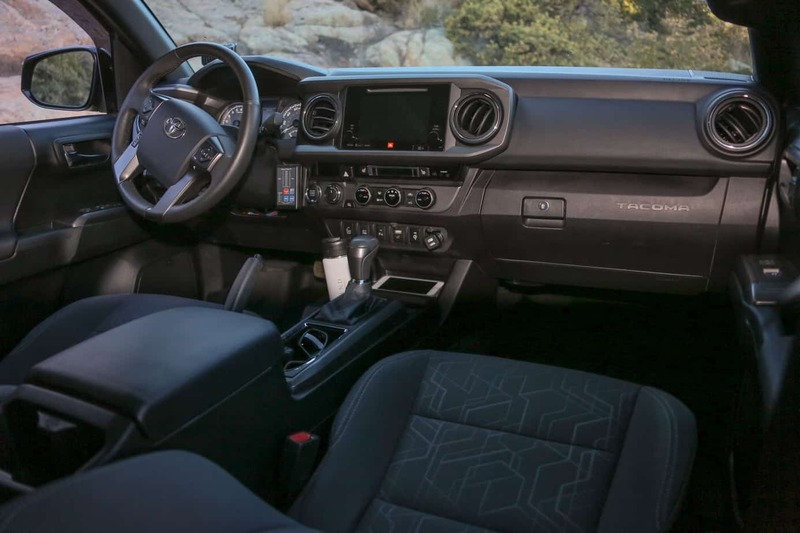 There are significant reasons why the Tacoma is such a popular option, primarily the legendary reputation of the drivetrain and chassis. Tacomas are well-documented to last 300,000-plus miles of hard driving, the indestructible legacy only being usurped by the Land Cruiser. 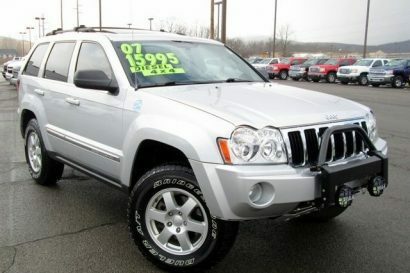 The vehicle proves to be very liveable, providing daily driving and commuting duties in addition to long forays afield. 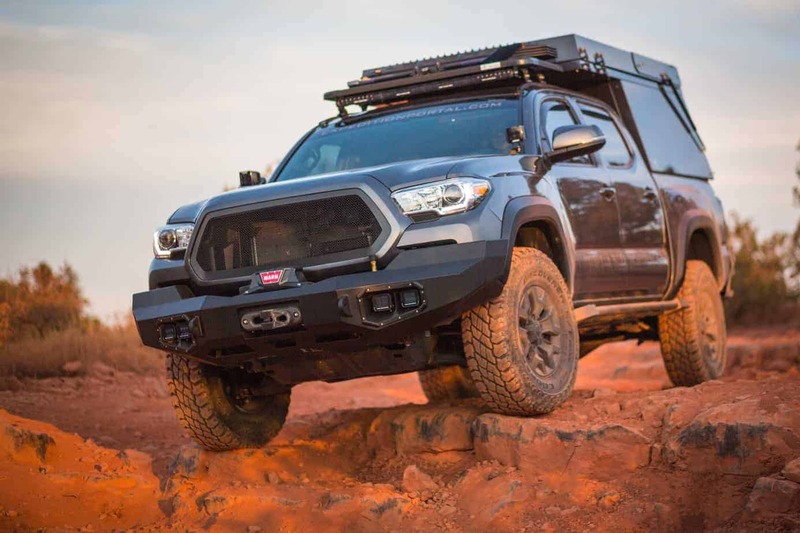 The platform is also supported widely by the aftermarket, and countless options are available for increasing performance, durability, and backcountry acumen. 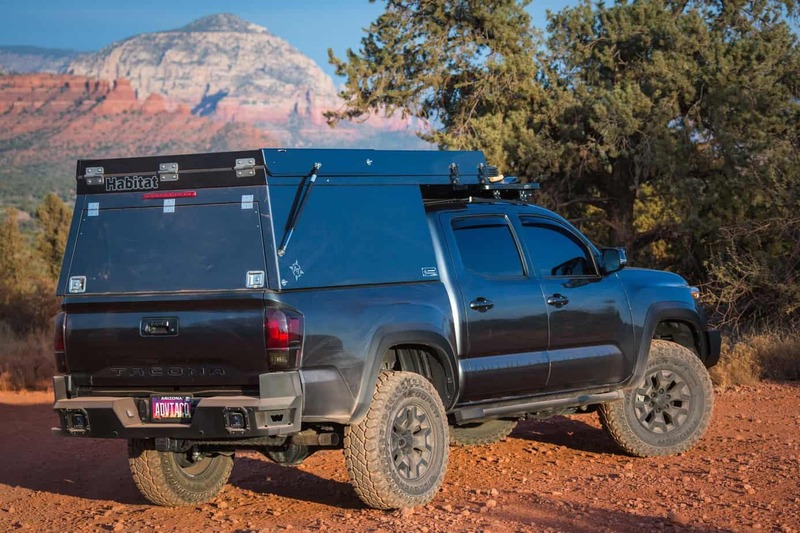 In late 2016, Overland Journal’s much-loved CFO, Andre Racine, placed the order for a dark gray TRD 4WD 4-door, which would be his personal vehicle, and let us help equip it for the backcountry. 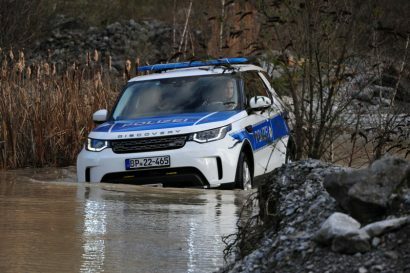 Many overlanders enjoy technical challenges along their route or at least want their vehicles to be able to negotiate difficult terrain or washed-out roads if required. We have long embraced the joys of remote and obscure routes, which necessitate a minimum level of preparedness and 4WD capability. Andre wanted trail protection to be a consideration, to shield the expensive new sheet metal and provide proper recovery and jacking points. For this, we turned to Warn for their Ascent front and rear bumpers. 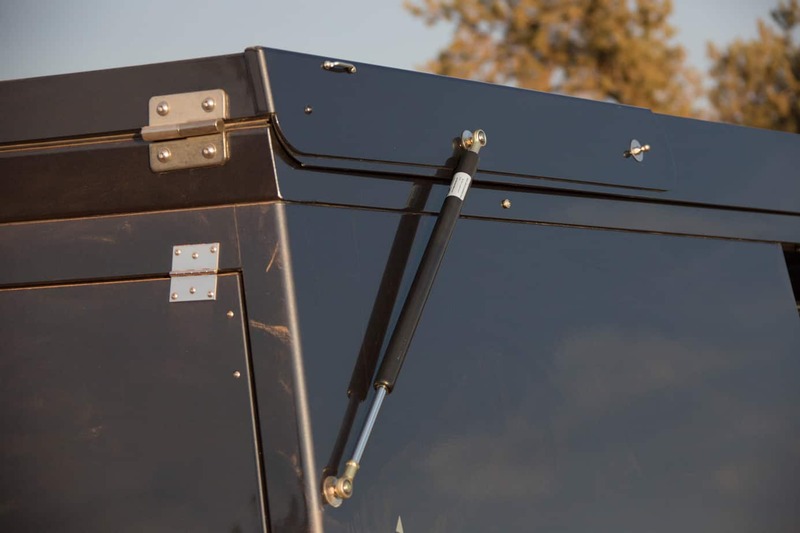 These heavy-duty steel units provide robust anchor points and a provision to mount a front winch. Unlike most other bumpers in the category, the winch placement allows full access to the rope and drum, aiding with spooling the line. This position does affect the approach angle slightly; something easily addressed with a small lift and larger tires. 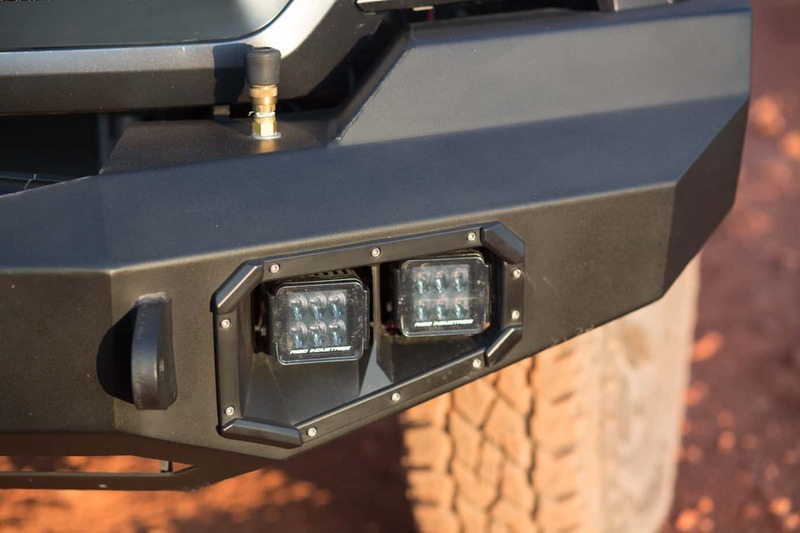 In the bumpers, Rigid Industries driving, amber, and flood lights were installed for improved visibility on the road and trail. 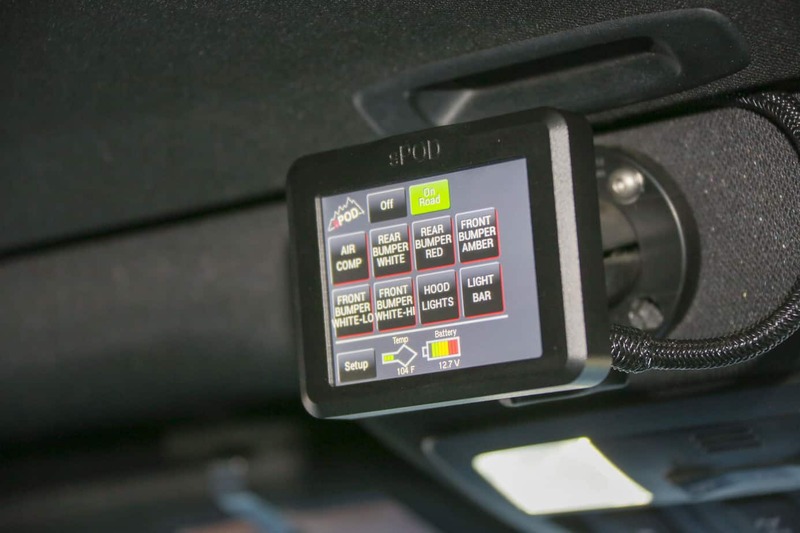 The lights and other accessories are managed with an sPod SE Edition touchscreen controller. 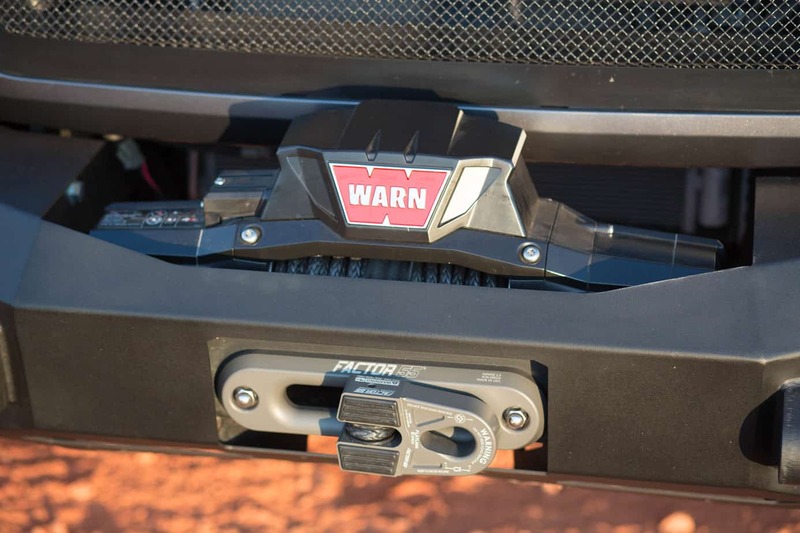 For the winch of choice, we wanted to test the newest technology and chose a Warn Zeon 10-S Platinum with synthetic line. This model is impressively fast and benefits from a rechargeable remote control, heat sensors, and electronic control of the clutch. For safety, a Factor 55 hawse fairlead and FlatLink thimble were used. The last bit of protection was a set of Demello Dominator rock sliders which bolt to the frame rails. Jason Demello was the first sponsor of that original Tacoma in 2004, so it was an honor to have him involved with this project a decade later. 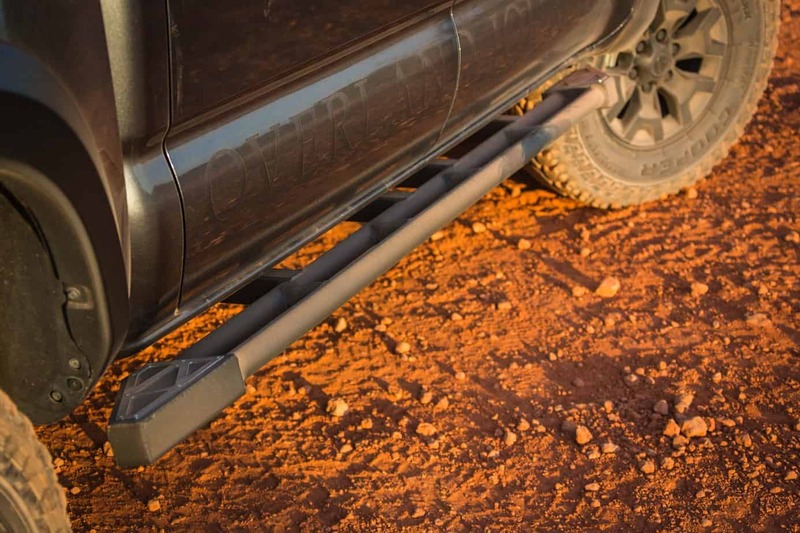 Demello Off-road Rock Sliders remain our favorite. We installed our first set over 13 years ago on our Gen.1 Tacoma. Up front, we mounted a Warn Ascent bumper with a Warn Zeon winch. 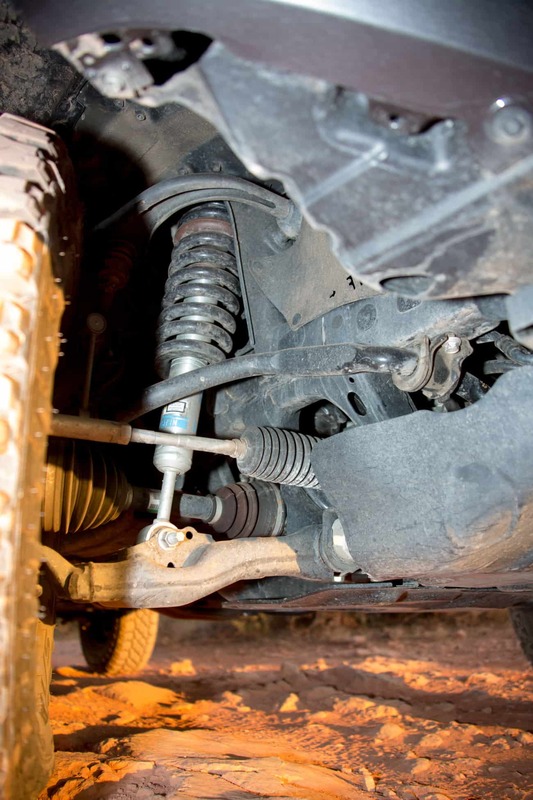 A Bilstein front suspension works with Deaver rear springs to support the travel load. 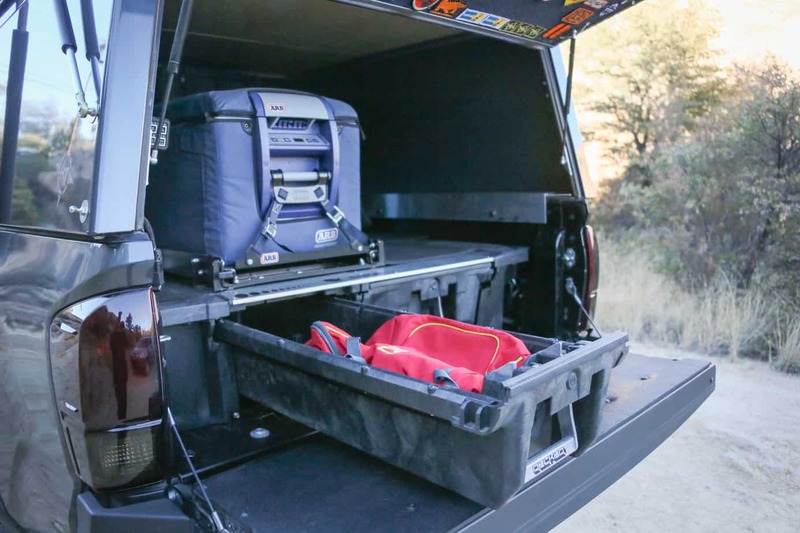 The short Eezi-Awn roof rack provides a perfect place to mount a set of MaxTrax recovery mats and a Rigid light bar. On the suspension, we deviated from the usual applications and specified a new kit from Bilstein. Out front, height-adjustable B8 5100 struts were used, and in the rear, 5100 shocks were paired with a custom Deaver spring pack. This suspension easily handles the weight of accessories, while still providing a comfortable ride. The amount of lift was tuned to 2 inches, which provided room for Cooper Discoverer S/T Maxx 255/85R16 tires. At 33 inches in diameter, this size allows for additional ground clearance and flotation but did not necessitate fender trimming. To keep with the stealthy appearance, the factory wheels were powder coated black. 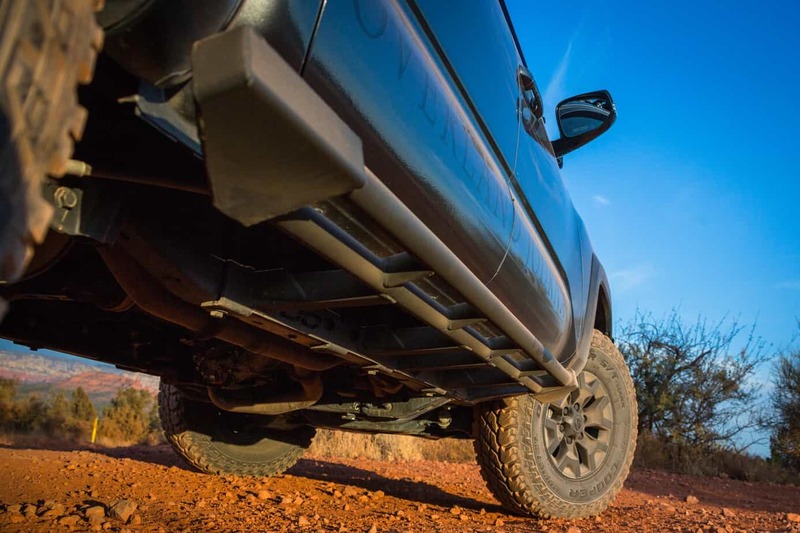 To air up the tires and operate trail tools, an Extreme Outback Products ExtremeAire Endura compressor was fitted, and air lines were plumbed to both the front and rear bumpers. A Warn recovery kit was selected, and a set of four Maxtrax were mounted to the Eezi-Awn K9 roof rack. SPod continues to provide impressive innovations for controlling remote accessories, and their new sPod 8 circuit SE system is no exception. 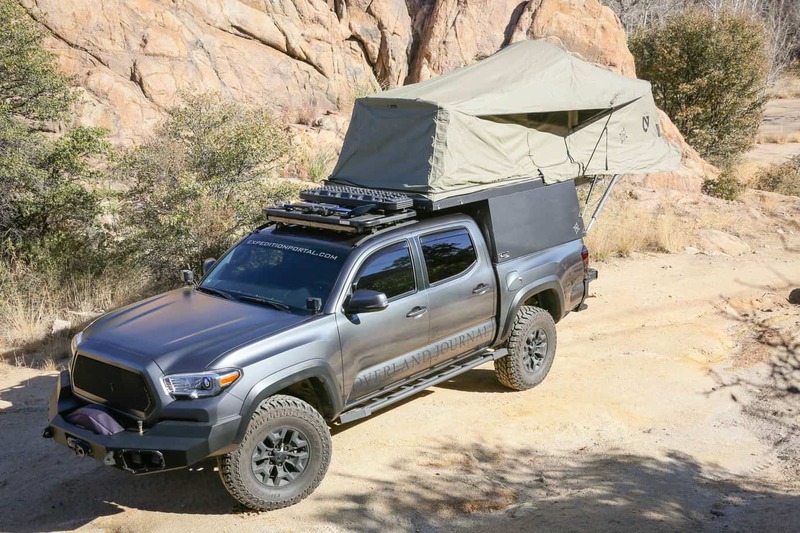 Decked recently launched their new Tacoma drop-in drawer system. The primary goal of this project was off-the-grid camping, providing self-sufficiency for days or weeks in the field, even under adverse weather conditions. This required a camper module to allow for above-ground sleeping, which can be a distinct advantage on muddy and rocky terrain. For this, we worked with AT Overland Equipment in Prescott, Arizona, to build one of their new Habitat truck toppers. Constructed primarily from aluminum, the canopy is both lightweight and durable, and all individual panels are replaceable. The unique design opens rearward, providing a massive awning and covered entry into the back of the truck. This overhang also serves as a queen-size bed with a comfortable mattress and gear loft. The tent is a collaborative design between Cam Brensinger of Nemo Equipment and Mario Donovan of AT Overland. Made from heavy-duty canvas, the tent has numerous windows and a high-quality feel. It has proven to be completely waterproof and able to endure high winds. The last step with the topper was to paint it factory gray to match the vehicle. 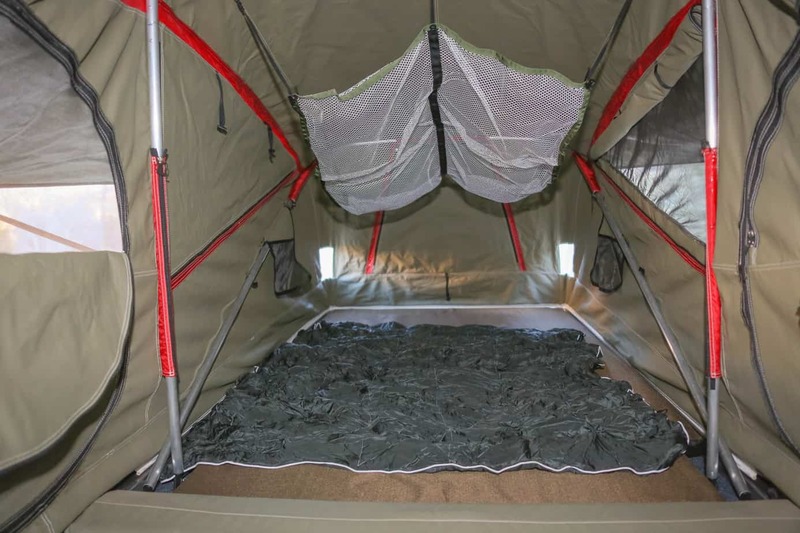 The inside of the AT Overland Habitat is a comfortable abode, with a thick mattress and tall roof line. Front Runner Wolf Packs abound and are perfect for storing camping gear inside. The attention to detail and durability of the Habitat is evident at every corner. In the truck bed, organization abounds with particular attention paid to the layout and accessibility. Andre installed a full-length Decked storage system that includes two cubbies and roller drawers. The quality is impressive and looks perfect in the back of the Tacoma. On the platform top, we mounted an ARB 63-quart electric fridge in a Transit bag to an ARB bearing slide. At the front of the bed, four Front Runner Wolf Packs are secured with Stratchit tie-down straps, accompanied by a Scepter water can and tool kit. 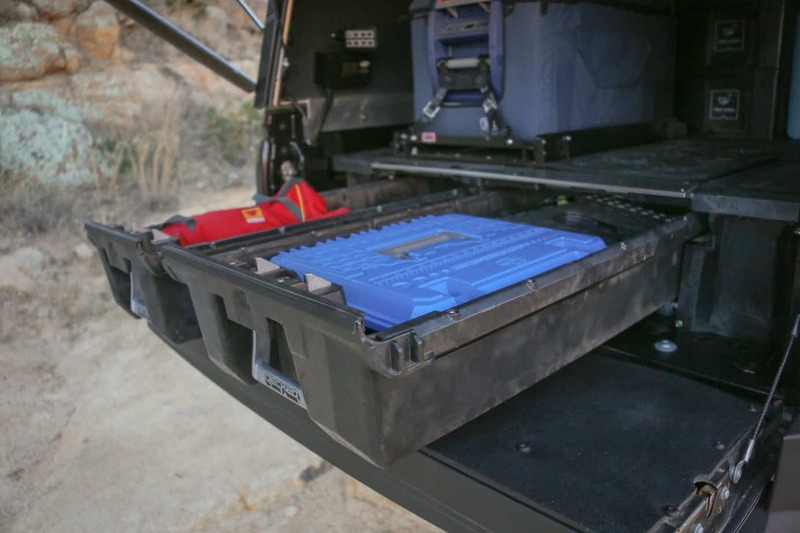 To manage electronics from the rear of the vehicle, an sPod membrane panel was installed to activate lighting and the air compressor from inside the camper. 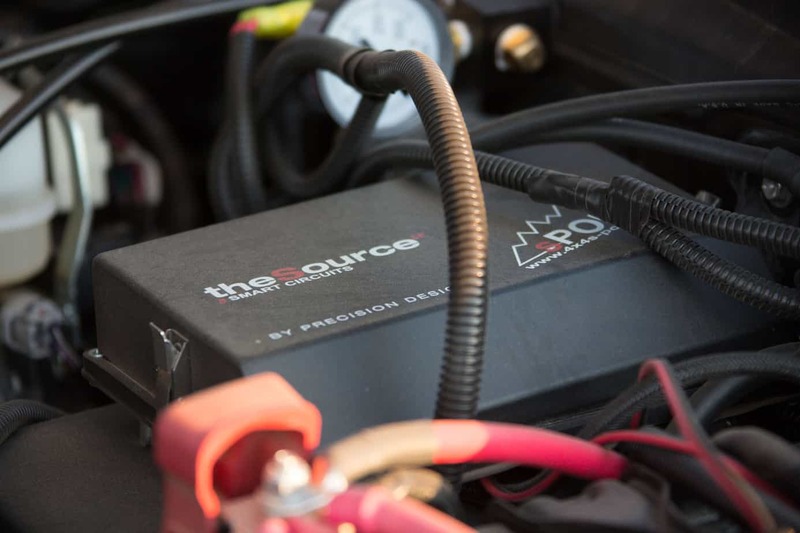 For auxiliary power, a Go Power solar charge controller was fitted, and the dual-battery system is managed by an IBS relay and monitor (Editor’s Choice, Summer 2017). 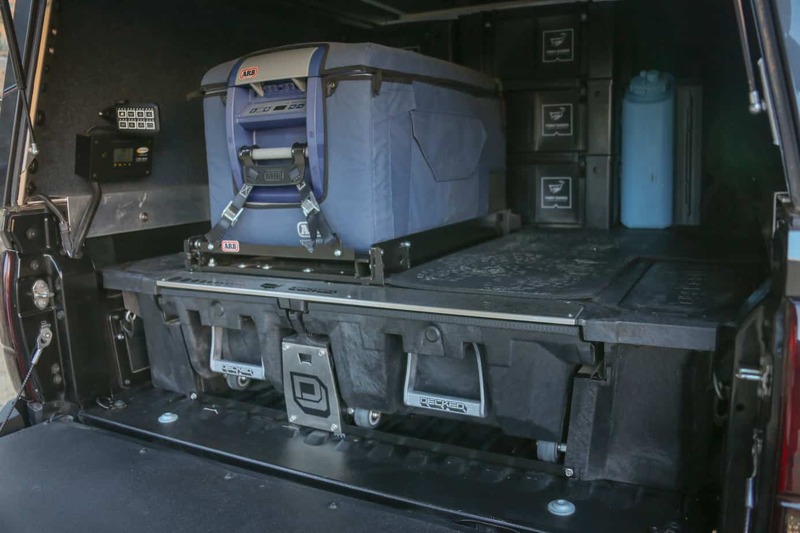 The Decked system is designed for installation in the Tacoma and features heavy-duty roller drawers and a completely flat load floor. 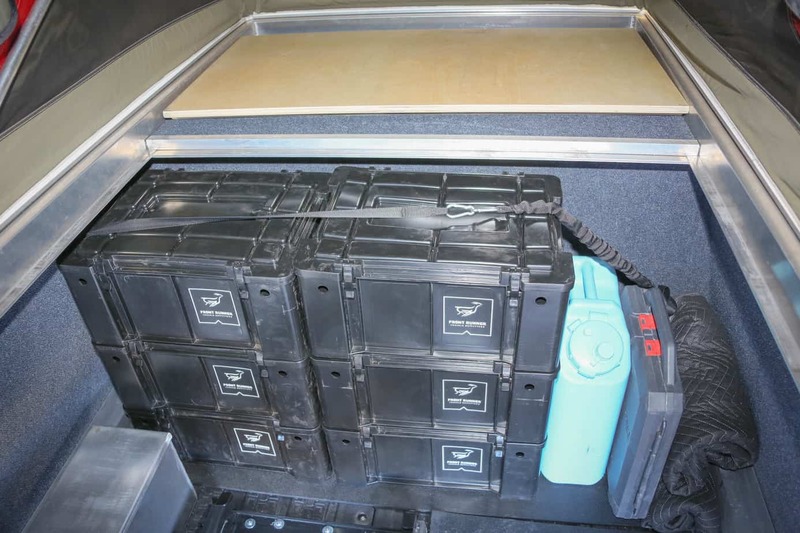 In the space fore and aft of the wheel wells, there are small storage cubbies that Andre used to mount an aux battery and stash other small items. This drawer system is rated to 2,000 pounds on the deck and is Made in the USA! 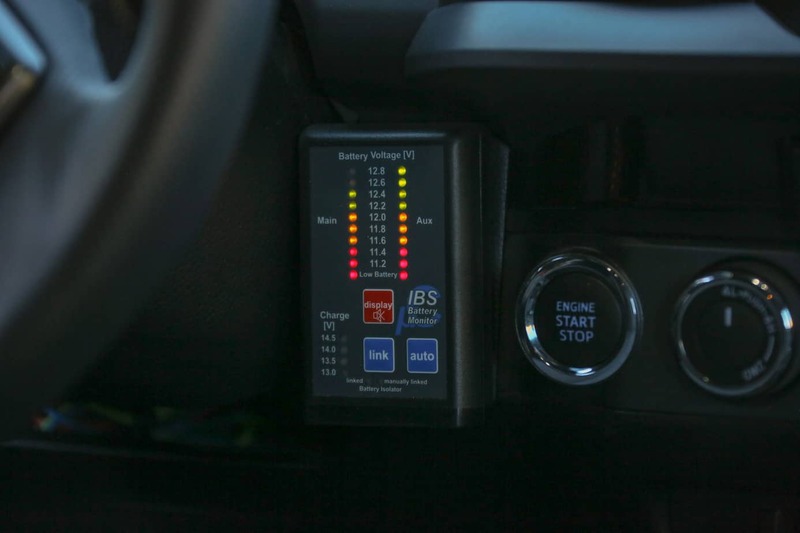 The IBS dual battery system controller mounts next to the steering wheel and allows for easy monitoring of the power levels. After a year of use, Andre could not be more happy with the outcome: a legendary Tacoma with all of the modifications and accessories needed to explore the globe. 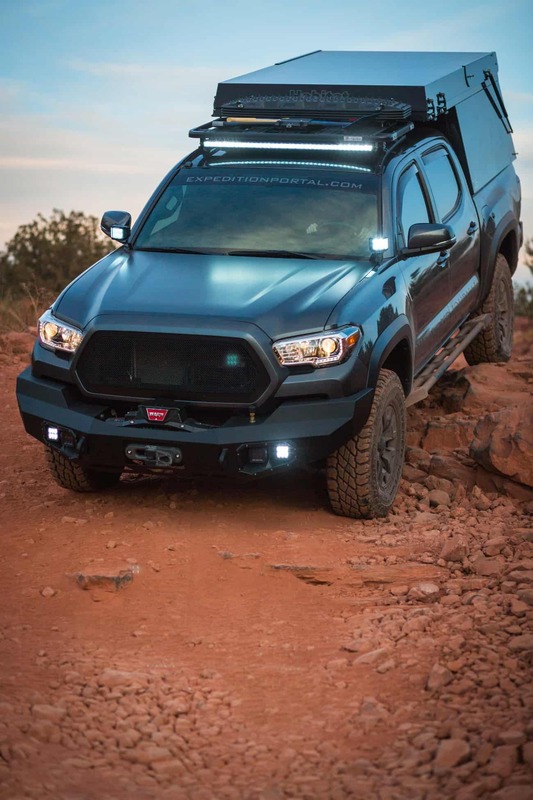 Having driven the vehicle on the trail, all of the systems work together to provide a competent exploration machine, capable of traversing technical terrain, but also fully equipped for self-recovery. The camping configuration is also impressive, with the comforts and tools required for weeks away from civilization. 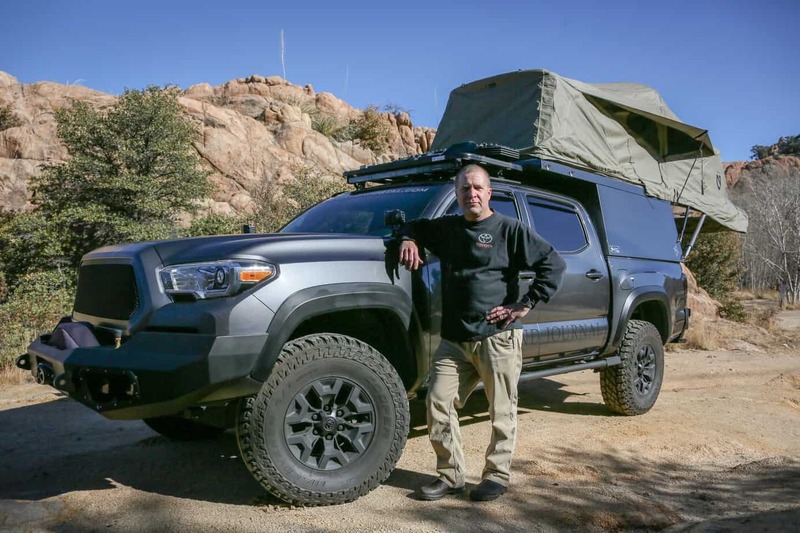 This Tacoma represents over a decade of lessons learned preparing vehicles for overland travel and was a fitting project to celebrate 10 years of Overland Journal. Andre is the CFO of Overland International (parent company of Expedition Portal) and the proud owner of our project Tacoma. He may love numbers, but he also loves backcountry exploring!